Bill Lackie: "2018: The Brand New 'Day of Leadership' - to Heal the Nations!" Happy New Year, dear Readers of the Elijah List! We wanted to start this year with a global word...for the nations of the earth. When a great NEW WORD FOR 2018 emerges, you want a seasoned prophet who is well-respected, especially when he or she lists country after country, and then gives a special word for each country. Today, you've found "that prophet" in Bill Lackie, who was raised up and trained by Christian International under the direction of Bishop Bill Hamon. The threat that has come from North Korea is the sound of an illegitimate lion trying to bring fear and disgrace. God has established His Kingdom in South Korea and other nations in the world that are praying against this false threat. There will NOT be an explosion from North Korea. The walls of the DMZ (demilitarized zone) will fall and North and South Korea will become one nation again. This will heal the righteous North and South Koreans who have prayed, travailed and labored from this reconciliation. There's much more good news as you keep reading this word...and you're going to be glad you sat down to read it and share it with others! This word of the Lord for 2018 came from visions and dreams I received and also came while in prayer. As I was praying for the current conflict with North Korea, I quickly saw a battlefield event. In this battlefield were hundreds of soldiers, vehicles, tanks and opposing soldiers of the enemy. An apparent conflict was brewing with the soldiers. They were stirred with apprehension and anticipation. Leadership was needed to cause safety to arise within this battle arena. So the stage was set with a need for change that will shift these events into safety. The leader of the US armies, General Patton, stood tall with a megaphone, ordering the armies from the US on the battlefield. Quickly, the soldiers responded to his orders stepping into position and moving forward with a battle attack strategy. General Patton continued to bark orders which were immediately followed. The battle continued with the enemy attack and with the army of the US advancing. General Patton never wavered in his orders of confidence. He positioned the army of the US to a wining position with a winning strategy. What could have become confusion and defeat, instead became winning and aligned strategy. General Patton made the difference with the soldiers becoming positioned to win and bring defeat to the attacking army. At the point of understanding the transactions occurring in my dream, the dream then shifted. There was still a battle and still soldiers from the US and the enemy on the field. But the General was no longer General Patton, it became General Eisenhower. 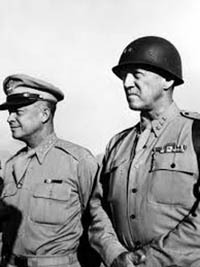 Strategically, the difference between General Patton and General Eisenhower was vast. They were both generals, but their strategy and approach were dynamically different. This difference was strategically important. General Patton was strong, loud, ordering and unyielding. General Eisenhower was a communicator, a friend, a relational leader, he involved teams and built impact and strength through people joining their strengths together. General Patton, was a leader who was independent, not needing others to help make his decisions, always plowing forward with boldness. General Eisenhower valued the purpose of each person, soldier and leader. He would communicate joining people who were in their position releasing their gifting and thereby building a strong, effective army. "This praise is KEY and will cause the apostolic throne of the Lord to descend. Wow, the Lord is waiting on this worship to begin to inhabit the praises of His people." In the dream, the battle was won under General Eisenhower, and at the end of the battle the soldiers rallied around him, lifting him upon their soldiers, cheering and celebrating the strength of their leader. General Eisenhower was a father to them. This father's heart had transformed the people he led, turning them into leaders that would cause the people around them to lead. This is a day of leadership. This is a day of generals. God is raising up an army releasing His authority in the earth today. This authority will release and prepare us as we shift into greater end-time strategy. Leadership, by basic definition, means someone who will take responsibility for themselves, their vision and others whom God gives them. The Scripture says that without vision the people will perish (Prov. 29:18). "Without vision" in the original language means, "A people who are unrestrained." So to be without vision means that you will walk around aimlessly with no direction, boundaries or restraint. Walking in leadership requires each leader to take responsibility for their process and how it affects others. This year, we will see more people who are currently in the Body of Christ stepping into their place of leadership. We will also see a ground swell of a younger generation from 30 years of age and below, who will arise with a clear understanding of their responsibility and are waiting to be authorized and covered by leadership in the previous generations. This year, there will be many who will rise to a new place of responsibility, expanding the leadership base in the Body of Christ, creating a broad stable base of leadership worldwide. It is necessary for this leadership to arise in this hour as God is causing His army, Joel's Army, to stand tall and firm and bringing stability to His Church. At first, there will be some shock, but this uncertainty will fade away quickly. This new army of leadership will be integrated into the foundation of the base of leadership for the Body of Christ worldwide. I saw angels of the Lord going behind many in the Body of Christ and calling them into leadership for the Kingdom's purpose. Heaven's purpose will be empowered by God's messengers, His angels releasing God's authority, over this new remnant of leadership destined to lead His Church. Angels will accompany this new leadership to release authority, power and demonstration in this day and hour. Angels will guide and lead the Body of Christ into divine confrontation with the powers of darkness to overcome and establish the last day Church and to usher in the greater works of the Kingdom of Heaven before the return of Jesus Christ. Some in this hour have labored, fought and ruled with God's grace. We are entering a private time or refreshing. This refreshing is a Biblical pattern after periods of war. Burning the light of your candle at both ends, as it were, will only leave you weak and burnt out. Learn to come away in intimacy with the Lord to be refreshed. This refreshing will ignite your passion. Passion is the fuel given to us by the Lord to energize us with enthusiasm, boldness and overcoming determination. We can exhaust the portion of passion the Lord has given us by using it unnecessarily on secondary issues: worry, fear and overextending ourselves. Guard your heart, for from this comes the wellspring of LIFE! Overflowing passion is yours as you continually receive a refreshing from the Lord. The result of passion on the rise within you is that you have enough for yourself and for others whom God has connected you to. This giving of passion is compassion. This year, compassion will be at an all-time high washing over the Body of Christ. Acts of kindness, genuine love and true mercy will enlarge the Body of Christ and the Kingdom of Heaven. Supernatural healings of the soul, body and relationships will be our portion. Believe the Word of the Lord and you will prosper...believe the Word of the Lord and you will be established! When you care more about being righteous than you care about being right you will begin to see divine connections between you and others in the Body of Christ grow deeper. The Scripture is clear to MARK those who cause division among you. Sometimes, division is just a strong, different opinion voiced openly, causing confusion and double-mindedness. This kind of division is dangerous and will kill the passion and compassion of the Lord. With this division it will be easy to be more interested in being right than righteous. The strong desires being heard, right and dominant, often come from roots of insecurity. If you truly know your righteous position in the Lord, your security will be strong and you will easily reach out to connect with genuine love to others with differing opinions. In the spirit realm this is a message to the Body of Christ: The explosion we are being threatened with will no longer be a threat but we, the Body of Christ, will release an explosion! This explosion will be a revival fire with signs, wonders and miracles. It is a crescendo of power from Heaven destined by God's divine time-table. Stand in faith and no FEAR, and pray with powerful declarations for all efforts of North Korea to fall, the DMZ to be removed, and North and South Korea unified. Africa will become a sign to the world of God's redemptive power. Leadership within Africa that have taken advantage of the peoples of Africa will be removed and leadership with the fear of the Lord will be positioned all over Africa. God has heard the cry of His people in Africa, and He will be swift to move on their behalf. As this nation repents of pockets of witchcraft...God's power will begin to establish a freedom, focus and favor that will travel from one nation in Africa to another. The people of Africa will reverse their desire to leave the country and will join hands and hearts to pray Africa into their new state of FAVOR! Australia is on the map of God's redemptive purposes. A powerful miracle anointing will travel from one church to another. Cutting-edge leadership in preaching, teaching, evangelism, apostolic authority and prophets with the wind of the Spirit will arise within this land. Social injustice, economic reform, spiritual alignment and righteous rulership will be characteristic voices washing the generational problems of this country. Australia, arise as a Sheep Nation! England will once again arise as a super-leadership power worldwide. There will be a shift of their international and national policy, averting internal war among factions within England. England has been a righteous example of judicial rule and will once again return to this God-ordained position. I believe the queen of England has prayed and covenanted with God to establish this righteous rule within England. A mighty move of the Spirit will begin to awaken the liturgical church in their country...abundance of worship music, teaching and healing demonstrations will flow with abundance in England. England will form an alliance with the US which will start a strategic flow of "Sheep Nations" worldwide. I believe Prince Charles, Prince William and Prince Harry will have a shift in their thinking as the righteous prayers of their generations are being poured out for them to see the Kingdom of Heaven. (I encourage you to pray into this.) They have unique, strategic roles for our worldwide redemptive purposes. Don't lose hope or underestimate God's power and call upon their lives. Decree, remain determined and walk in divine alignment concerning England. England is strongly in the focus of God to complete what He began. France is facing several years of transition. The leadership of France is being shaken and awakened. Many of their confidences are crumbling and God is answering the prayers of many righteous people in France to save their nation. France will begin to witness grass roots revival in homes, small meetings and cross-denominational boundaries. A sweetness of attitude and openness of heart will confront the roots of pride and release the genuine heart of thousands of people within France. God has heard the cry of the warriors of prayer all over the land. The land of France is being cleansed and positioned for end-time purposes. Germany is radically turning from established unrighteous roots within the land. God is going back to the generational roots and awakening righteous foundations of Germany. The people of Germany have cried out, feeling they have reached the end of their ability to wait. This desperation has caused them to cry out in travail and for their churches to explode with the light of God by the Spirit for the nation. Italy is currently going through a crisis of leadership direction. Political correctness has spread throughout the country and wants to prevent clear leadership within this nation. Older, wiser leaders within Italy will begin to clearly speak about the need of their nation. They will begin to turn the tables of this nation and establish their divine purpose within the world. A passion to love God is growing as the people of the nation are hungry for God's presence and revelation. Canada is experiencing a revolutionary wave of righteous people advancing the full purposes of God for their nation. Do not despise the day of small beginnings. The laws of socialism, which are seeking to devour the foundation of righteous laws, are shifting. The younger generations are seeking for the true, real and authentic. This search will release a return to justice with righteous rule. The United States of America has just begun the Biblical process of tearing down the altars of Baal. A fresh wind of the Holy Spirit is moving throughout the US, tearing down the altars of Baal to ignite the flame of revival. The mercy of the Lord...the eyes of the Lord...have turned to the US seeking true repentance. The roots of this darkness began with Madalyn Murray O'Hair...the author of atheism in the 60s. This darkness has grown like a snow ball of sin with the birthing of doubt and the growth of Anti-Christ darkness. The heart cry of the Lord is for this nation to turn back to Him. He is the Founder and Deliverer of the colonists of America. Repentance means turning away from darkness and turning your face toward Him. This transition is simple and childlike. Humility is the key releasing the present day LIFE of the Lord! "This is a day of leadership. This is a day of generals. God is raising up an army releasing His authority in the earth today. This authority will release and prepare us as we shift into greater end-time strategy." Isaiah 42:10 KJV, "Sing to the LORD a new song, sing His praise from the end of the earth! You who go down to the sea, and all that is in it You islands, and those who dwell therein." Prophetically, the eyes of the Lord are looking at the Islands to shift the Anti-Christ dominance released into the world. This praise is KEY and will cause the apostolic throne of the Lord to descend. Wow, the Lord is waiting on this worship to begin to inhabit the praises of His people. The islands worldwide are in the focus of the Lord for 2018. Praise will proceed power and purpose. Get ready, oh you islands, to worship and usher in the purposes of God in these times! Transition and change is on the horizon for these Middle Eastern countries. Where strategic alliances that are adversarial and have planned evil purposes, a supernatural adversity will be released in 2018. Their plans to cause war will be thwarted. Each of these nations have been motivated by deception, pride and confusion. In this next year, we will begin to see an adjustment in their aggressive plans to destroy countries who are spiritually aligned differently than these countries. The facade of how they present themselves will be exposed, showing the hopelessness and despair hidden inwards. Salvation belongs to our God...a call to pray with diligence for these countries will fan the flame of a grassroots movement bringing salvation to many in these countries. South America will reflect the demonstration power of God. This new wave of signs, wonders and miracles will begin to spread all over the world. South America will be a catalyst to transform the face of the Church of the Lord Jesus Christ. Their passion will reach a crescendo in the year of 2018. Creative and unique miracles of an encounter of the Holy Spirit will begin to spread to the nations who feel hopeless and desperate for the powerful touch of God. Geographically, the poles of earth will reflect a new touch of God that will connect the Body of Christ with great compassion and passion. These locations have, at times, seemed somewhat isolated, but we will see them reaching out with the touching, loving hand of God. I believe a scientific discovery will occur in both of these poles. Each discovery will be different, but will reflect the creative demonstration of the Lord. Get ready, the poles of earth will draw us together with love. The Nordic countries of the world will open a door to financial prosperity and establishment in the year 2018. Where there has been some struggle, the pouring out of God's blessing financially will turn around areas of debt that have accumulated for them over the years. Many of the countries of the earth will begin to research and examine this blessing that God will release. In doing so, in times of difficulty...there will be a discovery of the Father heart of God! There are under-provided locals that have cried out to the Lord. Surgeries, education and new ideas for business will begin to flow from Mongolia. Dictators in this region are focused on taking over the government of these communities. Salvation is coming from God as they have humbled themselves in the eyes of the Lord. From the outside it appears as a hopeless situation but the Lord is near for deliverance! Poverty and desolation have oppressed this country, causing a twisting in their belief and understanding of God. Religions for this region are crumbling and the Gospel of the Lord Jesus Christ are resurrecting with revival-healing meetings with thousands attending. The mercy of the Lord is reaching the out-of-touch and tender-needful areas of their lives. India, get ready for a new shift and the impact of angels to your region. The supernatural hand of the Lord will rescue! Vietnam, restoration and healing is coming near to you for this coming year. The travail of the Lord has been over you to come near to Him—to receive His love. Misunderstanding, religion and abandonment have plagued your country, obscuring the revelation of Jesus. An open door for encounter is swinging wide, beckoning you to enter His gates with thanksgiving! "My love is a banner over your lives to establish you in paths of blessing. Run into My courts for salvation, waiting for the shower of My HOPE. My heart has turned toward you for goodness!" In 2018, the glory of the Lord is touching the dry areas of darkness throughout the world. This season of restoration, revival and resurrection power is a time of global encounter as darkness covers the earth in these times. This encounter is an open door of compassion, reaching out as He has promised to touch areas of brokenness and desperation. The wisdom of the Lord will cause restoration in areas that have been thought impossible. Power encounters are resulting from grass roots prayer throughout the world. Jump into the river of God's will that is flowing and let it saturate into the deep places of your heart. Open wide your doors of worship and let this King of glory come in wide! Collectively, the wisdom of God is descending to resolve the stress of the past 5 years and begin to establish a new altar of worship, thrusting the Church into an open Heaven. Wisdom will cause the stresses of previous years to turn into strategy for overcoming and establishing provision for building the Church of the Lord Jesus Christ. "Lack and poverty will be confronted to draw the attention of the hopeless peoples, opening their eyes to My understanding and direction." Receive new strategies of hope and faith. This encounter is unlike any release prior to this season. Prepare yourself for this personal touch. America will become a leader of nations. The shadow of darkness that has overcome America is being shattered and the light of salvation and deliverance is coming to America. Along with overcoming power, humility will be the portion of joy that will transition the faith and strategy to establish the generational blessing of the Kingdom of Heaven through 5 generations. Godly leadership will take a shape that will attract using the Father's and Mother's heart of God. "This leadership is a fulfillment of the Scripture that I will turn the hearts of the fathers to the children and the heart of the children to their fathers." During this season, the United States will emerge as a leader of nations. As the glory of the Lord shines in this nation, there will be an expansion of the impact of the United States lighting the way to lead. These nations are crying out for a path to follow and the Lord will use the United States to light the way. Where despair and confusion has been their portion, the light of the Lord is coming to establish and open the door of transition. Pray for the nations to turn their eyes during this season of encounter to deliver them from bondages of darkness. Follow the encounter of this season! Bill Lackie: The ministry of Bill Lackie has been cultivated through 45 years of position in the local Church ministry and travel. By calling, he is an apostle-prophet to the local Church Body and to the nations. Through years of counseling, preaching, teaching, and prophesying, his ministry has developed with a prophetic flow of clarity and specifics ministered through a compassionate "Father's heart." Traveling nationally and internationally, Bill has established churches, been a keynote speaker at conferences, and prophetically ministered to heads of state and political officials. He has authored books and materials releasing saints in present truth ministry. Bill currently serves on staff at Vision Church @ Christian International and he and his wife are elders in the local Church Body. He presently resides in Santa Rosa Beach, Florida, with his wife, LaRue.